In 1987, founder Greg Grabill contracted his first window and door job on a handshake. He was a young craftsman from Michigan, who- while quite talented- had never actually built a window or door. While most would shy away at the thought of diving into uncharted territory, Greg was confident that he could engineer and build the windows and doors to the client’s exact specifications. It’s safe to say the rest is history. Today-nearly 30 years later- Grabill products now adorn some of the most exclusive homes in North America, and the company has evolved from a small garage operation to a nearly 38,000 square foot manufacturing facility here in Almont, Michigan. While our team has expanded over the years, Greg’s core values – his belief in always doing the right thing and crafting the highest quality, custom windows and doors on the market – continue to run wildly through the veins of each individual on our team. Grabill products are, and always will be: Built with Integrity. Built to Last. Integrity is so much more than a word to us; it’s a lifestyle. 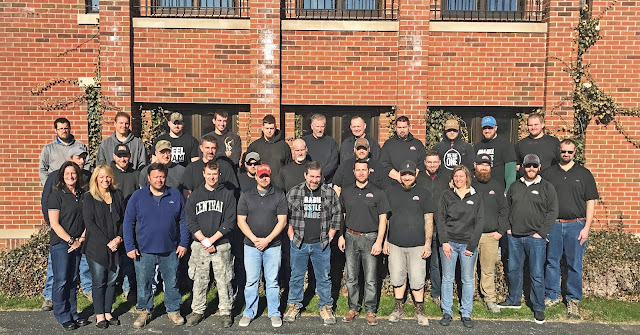 All of our windows and doors are proudly manufactured in the United States, where our talented team carefully and diligently designs and constructs each unit to the architect’s specifications, refusing to cut corners along the way. We work collaboratively with our clients, ensuring that they are actively involved in each decision-making piece of the project, and feel comfortable interacting with any one of our team members. In fact, I’m sure some of our clients have our phone number on speed dial. Our concept to completion mindset allows us the unique opportunity to support our customers from every angle, every step of the way. We pride ourselves on pushing the design envelope; saying yes when others say no. Whether the project calls for a thirteen-foot tall pivot door to grace the entry, or an entire glass curtain wall for your mountain escape, we at Grabill strive to say yes. We focus on continuously innovating; continually working to build upon our wide range of product lines, all while maintaining our reputation for crafting windows and doors that are truly ‘built to last’. Just like our customers, no two projects are alike, and we feel an obligation to keep our creative gears churning- designing new cutting edge, market-relevant designs for our most discriminating clients.